The time is drawing nearer for His return, whether we know when it is, or not, whether it’s in 5 years or 15 years. This is a question that I have been asking myself today. 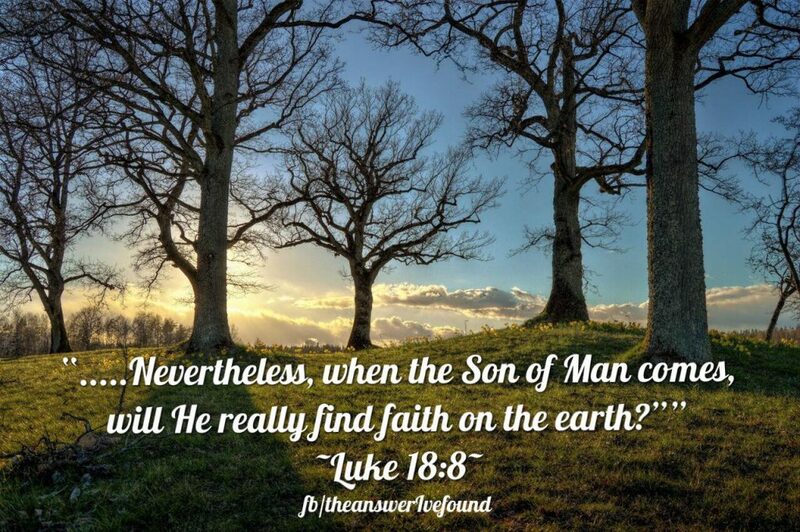 Will He find faith on the earth when He comes? When I look around I see less of those who are passionate believers, and not just those that are passionate, but those that sense His return and are actively carrying out His mission, as a whole it doesn’t seem so. Perhaps I’m not mixing in the right circles? But if we could judge passion by the actions of people, we have an indication of the answer. Perhaps it might be better called the inaction of people? I have been examining myself in this regard and I have to admit that I am so inconsistent. I have allowed myself to become overwhelmed by the cares of this world, and have been looking too closely at the state of this world than the stature of the Creator. A thought crossed my mind this morning? Would the Lord be pleased with me? Being pleased with me has nothing to do with his love for me. There is no doubt He loves me! Do I please God has nothing to do with am I enough, am I doing enough? Is He pleased with me? That has everything to do with faith. But without faith, it is impossible to please Him, for he who comes to God must believe that He is and that He is a rewarder of those who diligently seek Him. I feel that often my faith is sadly lacking. I have grown accustomed to doubt and unbelief over too many things. Why aren’t prayers answered? Why do bad things happen to good people? Why aren’t people healed? To me God is God and I don’t love him anymore or less because of what he gives me or doesn’t give me. There have always been things that I’ve struggled with, that I believe most people must struggle with. These things all bear more consideration and deliberation. You can’t manufacture faith. It’s something that increases by hearing the word. Too often I think with my mind not often enough my spirit. It’s not that I live according to the flesh but I’m very aware of the deeds of the flesh, all the crazy, sad, devastating things that are going on around us, that it can easily continue to prove the case of evil and hopelessness rather than the victory already won by our soon coming king. All these things that I see, I’m willing to see, I need to see but it’s hard and I need to see my God bigger than that! I need to promote and lift him up. High above all principalities, and powers, and the evil in the world, and even so much higher than the ‘good’ that is in the good people! He is far above, insurmountably better, infinitely powerful, the creator and the master craftsman of all. I need to be filled with the Word, to overflowing is the best way to be filled, so that it’s not just feeding me but others around me. Will he find faith in you? That’s a question only you can answer. And if your answer is no then why is it? Are you like me or are there other reasons that you need to address and work through? I want to be pleasing to my father by living a life of faith, faith as in my Christian faith, but faith as in my belief and expectations in God and his ways and works. When He comes will He find faith on the earth? Bible, faith, God, life, observations, serving, zeal. Bookmark.